On July 25, Greg Veliz (Miami) recorded the final out of the Chatham Anglers’ 6-3 victory over the Harwich Mariners at Veterans Field, forcing Tanner Morris (Virginia) to fly out to Colin Simpson (Oklahoma State) in left field. Like after any ball game, the pitcher’s mound is beaten up — divots and cleat marks are tattered around the bump — and it stays that way until around 1 p.m. the day of the A’s next home game. That’s when Austin Bergner’s (North Carolina) job begins. Bergner, one of Chatham’s top arms this season, has shut down opposing batters all season. The right-hander boasts a 2.38 ERA along with 26 strikeouts in 22.2 innings of work. Although he takes the mound just once a week to pitch, he spends more time with the Veterans Field bump than any other Anglers pitcher. The second-year Chatham player voluntarily refurbishes the mound before each home game so it is in tip-top shape come first pitch. Bergner had a similar role last summer. He and Chatham teammate Rodney Hutchison Jr. (North Carolina) alternated preparing the mound and home plate. This year, it’s just Bergner. On the day of a home game, Bergner typically arrives at Veterans Field around 1 p.m., two to three hours before any other Chatham player. Once he sets foot on the field, he pops on his ‘Dirty Heads radio’ playlist on Spotify, strips off his shirt and shoes and prepares to get muddy. The main goal of Bergner’s work is to fill the divots created by the cleats of pitchers. A pitcher’s back foot — the one that rests against the rubber — creates a tame divot, one that only takes 15 minutes to fill. The hole formed by the landing foot, however, presents Bergner with a taller task. He typically attacks it first, but Sunday, he saves it until after the smaller divot is filled. The North Carolina product starts his process with a bevy of tools — a broom, shovel, hammer, nail, sifting shovel, steel tamper and bucket spray. Each gadget is as essential as the other in repairing the mound. Bergner starts by sweeping any excess clay chunks out of the two divots with the broom. He clears as much space as possible in order to fill in new layers of clay. Before dropping in clumps of clay, however, two things must be done. First, Bergner digs through each divot with a nail to get rid of any turface — top surface, minute pebbles that coat the surface of the mound but can combine with the clay beneath it. When turface is mixed with clay, it makes the product nearly as hard as concrete, and it cannot be dug into with a shovel. He pries up these chunks of clay with turface in them and tosses them to the side. Next, Bergner draws a grid in the divot with the nail in order to combine the newly-layered clay with the current layer, rather than just dumping it on top. He sprays the clay inside the bucket three or four times, swishes it around with his hand and begins to fill the divot formed by the back foot. Bergner gets on his knees and starts to pack the damp clay into the divot with his bare hands. Once it is in, he takes the hammer and consistently mats it down, which makes it easier to reach the highs and lows of the hole until it is filled entirely. When the divot is filled to the surface, he whips out the steel tamper, Bergner’s favorite tool, to flatten the newly-established clay. “Here comes the exciting part,” Bergner said as he picked up the tamper. The right-handed pitcher rapidly pounds down the clay with the six-foot-tall tamper, the end of which he taped a garbage bag around to avoid the clay sticking to the steel until the divot is filled entirely and level with the surface of the mound. To see if it is truly level with the rubber, Bergner treks 10 feet to the side of the mound and crouches down as if he were reading the breaks of a green on a golf course. Once the first divot is filled, he follows the same steps the fill the second one. After both holes are packed to the brim, Bergner piles the excess chunks of clay and turface into the sifting shovel, allowing the turface to drop back to the mound while capturing the now-useless clay, which he throws away. 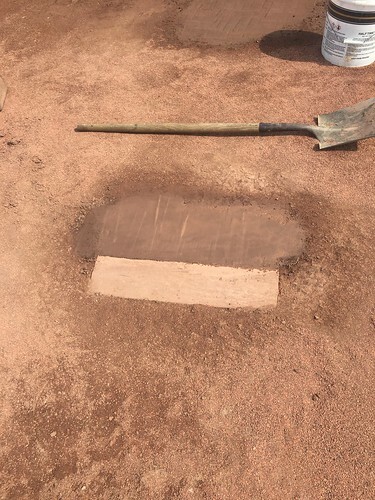 Even though the main part of Bergner’s job is complete, the new clay is still damp and needs time to dry, meaning he has to take one last visit to the mound before the game begins. While the Anglers take ground balls during warmups 45 minutes before the game, Bergner dumps a layer of turface on the newly-dried clay. The mound is now ready for action. Rainy or cloudy days are Bergner’s worst nightmare, he said, because the wet clay will not dry by the start of the game. After Alek Manoah’s (West Virginia) start against Y-D on July 21, the big right-hander scolded Bergner for doing a substandard job repairing the mound. It was not sunny enough prior to the game for the clay to dry. After Manoah’s start against the Commodores on Sunday, he did not seem to think Bergner improved on his last job. Despite Manoah’s complaints, Bergner said he hasn’t gotten any grief from other A’s pitchers. 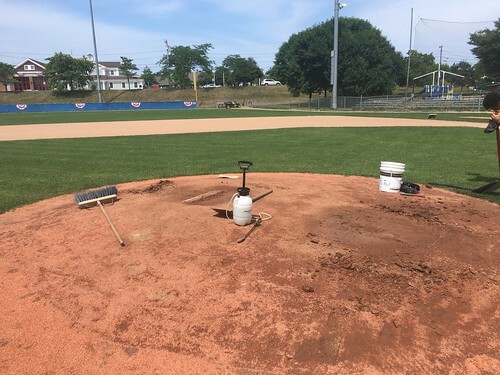 The Florida native takes pride in his work and insists on fixing the mound as long as Chatham’s upcoming playoff runs lasts. After all, filling the divots is far more complex than most can comprehend, and Bergner is one of the only ones who understands how to do it.